Being farmed (or simply attacked) and loosing a lot of resources you worked very hard for is really annoying, especially during the first few weeks of the game when a lot of resources are needed for building your basic city. Add to that the possibility of loosing any number of troops if you decide to defend your city, and you see why it is helpful to minimize the chance of being attacked/farmed. 1. Invest in a vault (/Strongbox) ! Plainly the biggest reason for farming in this game is for the resources it nets you. Every player who spends enough time on this game will sooner or later find out he can produce troops faster than his fields can supply him. So you farm your neighbors. Luckily the game has given the player the option to invest in a 100% theft-proof solution: the Vault! The vault in my opinion is one of those few buildings, next to for example the Watchtower, that should be upgraded as soon as possible in the game. I had my vault at level 8 before the rest of my city was level 5-ish. If there is nothing to get, the farmers will stay away. 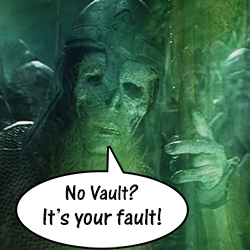 There really is no excuse not to have a proper vault, and it hurts my brain to see people in chat telling of how they were farmed and lost all of their resources…..invest in a vault (and Strongbox research)! As mentioned, the watchtower can also be incredible useful in deterring attackers. With regards to resources, a sufficient level tower will give you the times of incoming attacks. This gives you the opportunity to check your resources and see if anything is beyond vault capacity. IF this is the case, you can try to move around resources away from the attacked city to either your second city, an alliance member or the alliance bank, to be requested back later. As I explained in my post on Wall Might, another reasons for other players to pay you a visit is for the easy kills wall defense troops offer. Bottom-line: Large walls will eventually be taken down by bigger players looking to rise on the leadership boards. Do not rely on walls to defend anything in your city, instead invest in a proper vault. Besides wall troops, normal troops that are not hidden in the keep can also attract bigger players, for which they, if the other player has a sufficiently high level hero, also offer cheap kills, especially when the defending party has no or a low-level hero assigned to training position. In principle, always put your troops on hiding. Gold is the least important resource in this game. Firstly because it used the least; after a week or two you only really need for research and hero salaries. Your gold cannot be protected with the vault, but the same goes for everyone else, hence why it is the easiest farmed resource. My farming trips net me twice as much gold as the next highest resource…always…so do not try to protect it with a lot of wall might or with un-hiding your troops….the gold is expendable. Of course there is also a category of attacks which are is not preventable. In a war with another alliance, you are bound to be attacked…There is little you can do to stop this. Hide your troops and be safe, or face the challenge and try to zero the attackers. It will occasionally also happen that players who you have farmed will come back for revenge. Little to do about this as well. You could try to zero them to deter them from attacking again, or keep farming them over and over until they get the message. If they are much much bigger than yourself, maybe try to leave them alone….? In conclusion, the easiest thing you can do against being farmed is building a proper vault, case closed. The other points given can also help, but are not nearly as important as having a decent vault! This entry was posted in Articles, Strategy and tagged farmed, farming, gold, hide troops, kingdoms of middle earth, resources, strongbox, vault, wall might, watch tower by beardmonkey. Bookmark the permalink.